Welcome to "Armenians for Kerry"
"Armenians for Kerry" is organizing Armenian American Democrats, Independents, and Republicans around the vital mission of electing John Kerry - a long-standing, principled, and effective advocate for Armenian issues - as President of the United States. 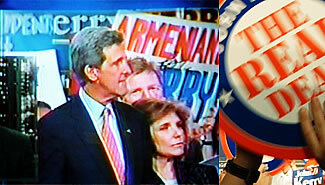 On the issues Armenian Americans care about - as Armenians and as Americans - John Kerry is the clear choice. He is a candidate that our nation's more than one and a half million citizens of Armenian heritage can proud of, for his record of service to our nation, and for personal involvement in all the vital issues of special concern to Armenian Americans - genocide recognition, a strong Armenia, increased aid, expanded trade, and an end to the blockades. * Senator Kerry has forcefully fought for U.S. recognition of the Armenian Genocide. He is currently a cosponsor of the Genocide Resolution, S.Res.164, and he voted, in 1990, on the Senate floor for Senator Bob Dole's (R-KS) Genocide Resolution. * Senator Kerry has been a vocal and effective champion of stronger U.S.-Armenia relations and has consistently backed legislative initiative to increase aid and expand trade with Armenia. He is currently a cosponsor of legislation, S.1557, which would grant Armenia permanent normal trade relations status. * Senator Kerry has repeatedly spearheaded of initiatives to lift the Turkish and Azerbaijani blockades. In 1991, he was the lead sponsor of Section 907 of the Freedom Support Act, which restricts U.S. aid to the government of Azerbaijan until it lifted its blockades of Armenia and Nagorno Karabagh. He also worked for the adoption of the Humanitarian Aid Corridor Act, which called for U.S. aid to Turkey to be cut off unless Turkey lifted its blockade of Armenia. As recently as this January, Senator Kerry formally called on President Bush to press the visiting Prime Minister of Turkey to lift his nation's illegal blockade of Armenia. In sharp contrast, George W. Bush has broken his promises and repeatedly betrayed the trust of the Armenian American community, opposed the issues they care about, and presided over the most anti-Armenian administration in modern history. Almost immediately after taking office in 2001, he abandoned his campaign pledge to properly recognize Armenian Genocide. For all the details about President Bush's failure on Armenian issues, visit the website of the Armenian American Democratic Leadership Council. The difference could not be greater. Join with "Armenians for Kerry" in helping to educate voters, generating campaign support and financial contributions, and mobilizing grassroots pro-Kerry get-out-the-vote efforts leading up to Election Day - November 2nd. Armenians for Kerry works in partnership with the Armenian American Democratic Leadership Council (AADLC).